"Up your game" with these officially licensed LSU Tigers corn hole boards! 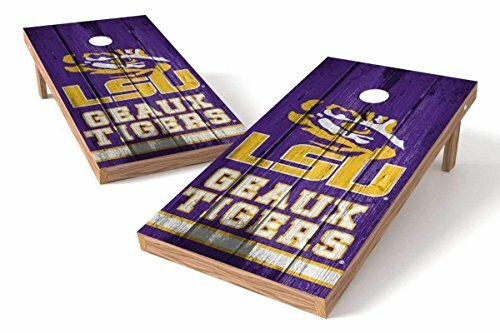 Whether you're tailgating every weekend or taking to the backyard before the big game, show your pride with the highest quality LSU Tigers corn hole game on the market. All of our NCAA corn hole board sets come with two premium quality boards and a set of eight (16 oz) all-weather corn hole bags. These boards are in full compliance with all ACA (American Corn hole Association) rules and regulations and come ready to play with no assembly required. Shipping time varies based on your location and the shipping option you select at checkout. All shipments are protected against loss or damage. All of our corn hole boards are built to the highest quality and durability standards so you can enjoy your game for years to come! We're proud of our boards and we want you to be too! See our Construction page to learn more. If you have any questions about this product by PROLINE, contact us by completing and submitting the form below. If you are looking for a specif part number, please include it with your message.